Bestselling young adult author Leigh Bardugo peeked from behind a door at the Edison on Friday night, causing a dull roar from the crowd of loyal fans. The room buzzed with excitement as fans of all ages — some even in costume — waited for the self-proclaimed “beach goth” to speak on her newest book. 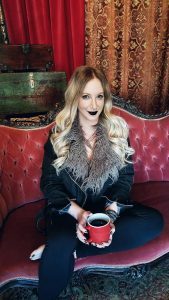 Bardugo, creator of the Grishaverse — the setting of her book series that has expanded across six novels — came to Oxford to discuss “King of Scars,” the newest addition to her fantasy series. She offered a 30-minute Q&A session where readers could ask about anything from her writing process to the reasoning behind the outcome of her last book. Bardugo first visited Oxford while on tour in 2012 for her first installment of the series and freshman novel, “Shadow and Bone.” Sami Thomason, the Square Books, Jr. employee in charge of the event, told attendees that the event was a dream come true since she is a fan of the Grisha novels as well. Earlier this year, Netflix picked up Bardugo’s saga for an eight-episode series. After being asked if she would make a cameo in the show, Bardugo said that she wasn’t sure but that she had a storyline in mind. After a fan thanked Bardugo for the LGBTQ plotline in “Six of Crows,” Bardugo went on to emphasize the importance of inclusion in literature, especially when it comes to young adult fiction. Bardugo also talked about “Ninth House,” her first attempt at an adult novel, which is set to come out later this year. Set in New Haven, Connecticut, “Ninth House” deals with murder, dark magic, the occult and life in secret societies at Yale. When asked about the ins and outs of her writing process, Bardugo addressed the fear and insecurities that come with writing a first novel. Bethany Fitts, a senior English major, said she’s read Bardugo’s books since she was in high school and was initially drawn to the setting’s rich Russian roots. Despite not initially planning on attending the Q&A and signing, Fitts said that meeting Bardugo was something she is glad she decided to do. “(Meeting an author)is something I kind of always wanted to do but never did,” Fitts said. An aspiring writer working on her senior thesis, Fitts said that Bardugo’s advice stuck with her. “Even hearing her say that she goes through that — not wanting to show her editor stuff — it’s reassuring,” Fitts said.